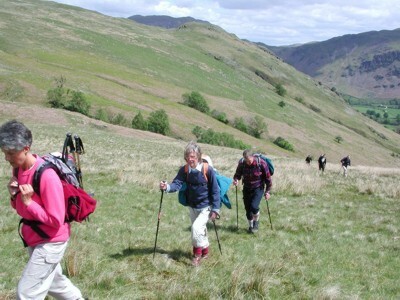 Whether you would like to climb the highest Lake District mountains such as Scafell Pike, Hellvellyn or Skiddaw, try a scramble or an airy ridge walk or explore the valleys and Lakes, I can use my experience and local knowledge to choose the best routes to provide you with an enjoyable and exhilerating holiday. My charges are based on £20 per person per day with a minimum charge of £60 per day. (half price for children). There are also discounts for bookings of 4 days or more. 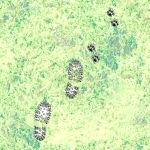 I am happy to take you out for one or two days during your stay or to organise a whole weeks walking. If there is one particular walk you need guidance on I can sometimes be flexible with dates to allow for the foibles of Cumbrian weather! 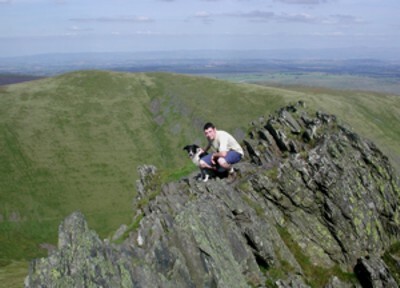 Did you watch Julia Bradbury with her Wainright Series on TV and fancy the challenge of Sharp Edge on Blencathra? Provided the weather is fine and you have a good head for heights it provides a challenging and memorable day. Haystacks - Wainright's favourite - is also a superb day out with just enough scrambling to make it interesting. 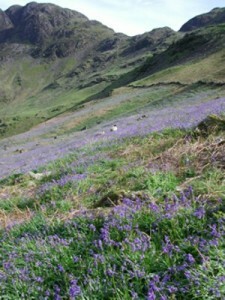 Here it was the end of May with the bluebells in full bloom. Maybe you know the Lake District yourself but don't feel happy about being in charge of a group. It is one thing taking yourself and a partner up Great Gable but quite another looking after several other people. As a qualified Mountain Leader (MLT Summer) and with many years experience of climbing and walking in the Lake District, I can ensure you of an excellent holiday whatever sort of mountain walking you want. Rambling Clubs often economise by leading their own holidays; but if you want this Club Holiday to be one of the best you've ever had let me plan your programme and lead you on the hills . I know you'll be back for more next year.